As soon as I got engaged one of the things I was most excited about was asking my favourite ladies if they'd like to accompany me down the aisle. I've always considered being asked to be a bridesmaid a huge honour, and there's no better way of showing a friend how grateful you are of their love and support than asking them to play a huge role in the most important day of your life. My bridesmaids are made up of five very special ladies, and although this may seem like quite a large number, I can't imagine my day without having each of them by my side. Unfortunately the lovely girls in my life are scattered all over the place, meaning that I don't get to see them as often as I'd love to which made asking them the all important question a little tricky. I wish I could have asked them all in person, but with no immediate plan to see most of them and finances pretty tight I decided to surprise them all with a special card. I've had an agonising few months waiting whilst we got our venue and date finalised and I've been desperate to ask them for what feels like the longest time! 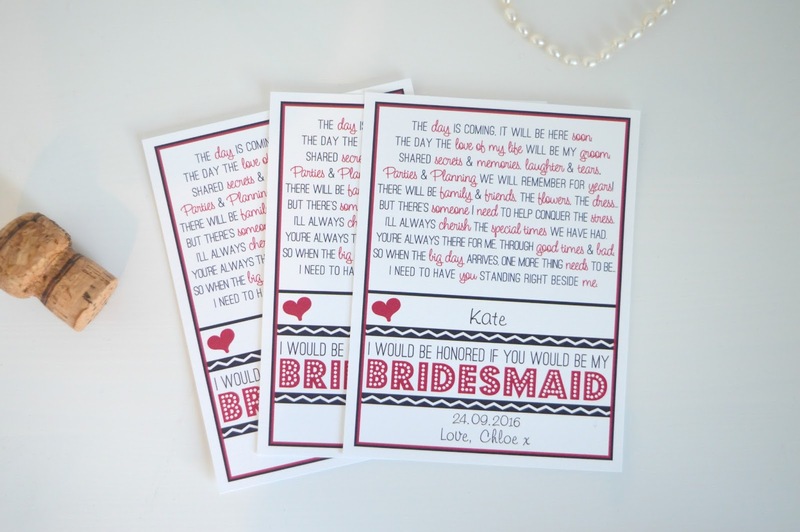 I had a few ideas of special ways I could ask "will you be my bridesmaid" but in the end I decided to go for something simple with these really cute cards I found on Zazzle. I wrote each girl a special message and quietly popped them in the post. I wish I could have been there when they each opened them! So! To Lydia and Eleanor, the best sisters a girl could ever ask for; Clare my oldest friend who knows me better than anyone and Kate and Lauren friends who have always been there for me and made me realise just how special they are since I've relocated up north ... let's do this! I was the same, I couldn't wait to ask my best friends and my sister to be my bridesmaids!